Robinsons Cider only produces limited amounts of premium quality cider each year. To keep control of what’s going on and to maintain standards we make only two products, one for retail outlets and Home Delivery and the other for on premise consumption. We only make two ciders, both premium quality, both traditional: one draught, one bottled and each quite unlike any other: the confidence to be different. Secure and easy ordering: decide what you want, click on it and let PayPal and Robinsons do the rest: delivered to your (mainland UK) door. Check out the map, see where you want to go and just click on the flag to locate & find out about the nearest outlet that stocks Robinsons Cider. 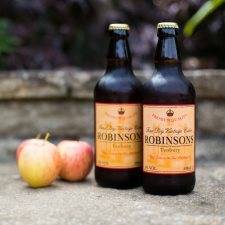 When we say no one makes cider like Robinsons make cider, we’re talking about the confidence to be different, to limit the quantity we make and to limit ourselves to just two absolutely premium quality ciders, Robinsons Flagon Cider on draught (4.5%) and Robinsons Fine Dry Vintage Cider in bottles (6%) . 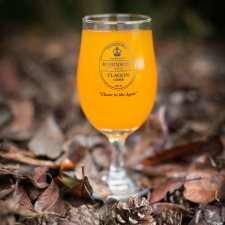 These ciders are only available locally and are unlike any other. They are even completely unlike one another. We are independent and only supply independents. We don’t supply pub chains or supermarkets other than the local ones. We support our pub trade by making Robinsons Flagon Cider available only on draught. When folks want it (and they certainly do) they support their local pub by drinking it there. Our Fine Dry Vintage Cider is presented in bottles in selected retail or catering outlets and on line: go the Home Deliveries page to find out more. The bittersweet apple juice we use in our Fine Dry Vintage Cider comes from the first pressing: we only use the first two thirds of the juice and then discard the apples (the cattle love them!) so that Robinsons Fine Dry Vintage is to cider what extra virgin is to olive oil. It takes at least 2lbs of classic cider fruit to produce just one bottle of Robinsons Fine Dry Vintage Cider. The brand is more important to us than the number of gallons we sell. When your own name appears on something and you spend your life among the people who drink it, that can often shape your approach to things! The flavour of Robinsons Tenbury Cider is in a class of its own. What would be the point of any of this if the flavour wasn’t special? Not just special, outstanding? Robinsons make authentic country cider that has real finesse. The colour is rich and unusual. The stunning, fresh aroma of traditional cider apple varieties. A long, clean aftertaste. We use cider fruit from our own orchards and the orchards of our friends and neighbours. Some of these orchards have provided apples for Robinsons Cider for generations. We press it in the autumn: real hard work. We ferment it over the winter. Then, when the cuckoo comes, we taste it and blend it to produce the final thing. We only use traditional bittersweet cider apple varieties: no eaters or culinary fruit at all. It savours of the good soil that will carry such apple trees, of the rain and of the sun. Well over 200 years have rolled by since Robinsons started making cider in Tenbury, “The Town in the Orchard”. We don’t make much and when it’s gone it’s gone. But what we do make is probably the best cider you will find anywhere.